Is your PC running slowly? Do you feel many errors while operating something in your PC? Then there is only one better solution for getting rid from these PC issues, “Wise Care 365”. Wise Care 365 will definitely turn your PC into a fast running device. Let me explain why a PC needs Wise Care 365. When you bought your new PC, its processing speed was good enough at that time. Then what happens when it becomes an older one? The answer is, when PC becomes old, its memory got captured by errors, bugs, and the temp files which finally responsible for slowdown of your PC. Hence you all need to clean or fix the errors, bugs and the temp files from PC. And how can we clean, just by using Wise Care 365. The more detail and procedure about “How to use” is mentioned below. The software installation is followed by a few easy steps. You do not worry about its installation; just follow the steps that appear on the screen. As the software is completely independent, so you do not need to install any third party while installing Wise Care 365. The software package is fully tested before uploading, so there is no chance of the virus. You can easily install this Wise Care 365 on Windows XP, 2003, 2008, Vista or 7 OS (compatible with both 32 and 64-bit systems). Another important point is its interface. While installing you are offered with 5 different stylish skins to choose. You can choose any one of them and then also an option of choosing desired language. After completing the installation, the main window will open and you will see that it is not complicated, but is organized and elegant. You will find a set of toolbar at the top with 5 keys, each contains different tools. 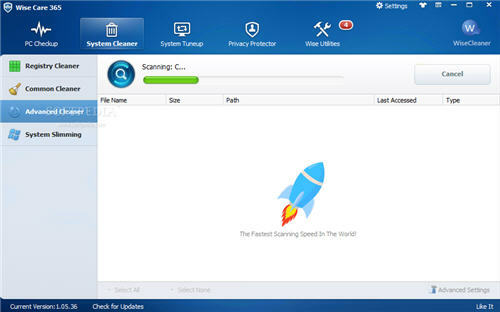 The different tools are PC Check-up, System Clean-up, System Tune-up, Privacy Protector and Wise Utilities. You can choose any of them, depending on what level of optimization you want. The main class is PC check-up, in which you can start a general check-up of your PC and adjust it accordingly, in just few clicks. If you need to know about the different product from Wise, then the wise category is for you. You can download more wise products from the Wise Cleaner Official Website. Wise Care 365 can easily make your PC error free, bugs free. It defrags your hard drive disc and cleans all the errors from the registry panel. Wise care 365 also responsible for cleaning all your junk files, internet browsing history and memory dump files. By doing this all, you make your PC to run fast with providing higher performance. And this all can be done by just simple few clicks. The latest update of this software supports in Windows 8 OS (including 32bit and 64bit). Although, it’s totally supportable in Windows 7, Windows XP, Windows Vista also. The action of cleaning internet browsing history is limited to following browsers that are Internet Explorer, Mozilla Firefox and Google Chrome. The Wise care 365 is 100% free. So, don’t need to pay a single penny for using this software. Your PC performance increaser tool is fully in your hand. Just download it by following the link which is mentioned below. Although, this Wise care 365 is very much stable and consumers can definitely take all desired advantage of their computer by using this software and improving its performance.